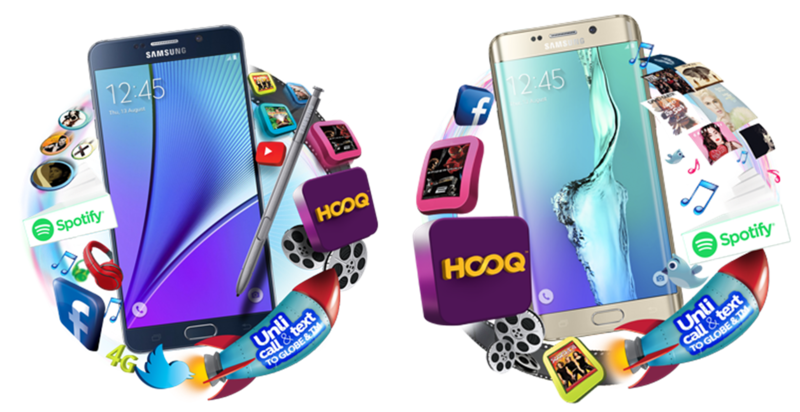 Globe Samsung Galaxy Note5 starts at Plan 999; while the Globe Samsung Galaxy S6 edge+ is at Plan 1499.Get the bundles and pricing details here! Globe outs initial pricing for the wildly popular Samsung Galaxy Note5 and Galaxy S6 edge+. The handsets have been officially released by the Korean giant earlier this month and both performance-oriented handsets are now in your Wonderful Network. 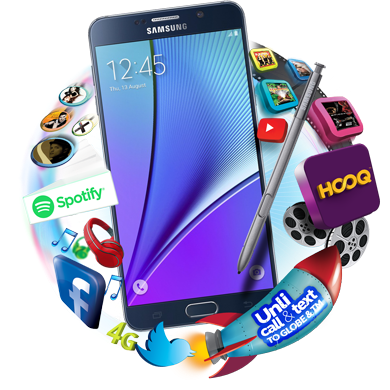 The latest iteration of the Galaxy Note line of smartphones is now on Globe Plan 999 with monthly cash-out of Php 800 for 24 months. If you subscribe to the service, you have an expected monthly service fee of at least Php 1799. The plan comes with unlimited calls and texts to Globe/TM and GoSURF 499 with 3GB of monthly mobile internet allocation. Likewise, subscribers will also enjoy free 1 month of Gadget Care, Navigation Bundle; and 1 GB of Globe Cloud storage. 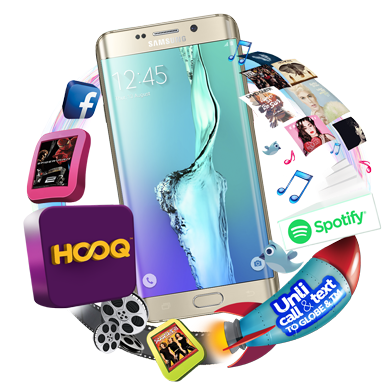 Globe Galaxy Note5 subscribers will have free 3-month access to both Spotify and HOOQ. The bigger version of the best-selling Galaxy S6 edge is also available under Plan 1499 with monthly cash-out of Php 800 for 24 months. In short, you'll get the 32GB Samsung Galaxy S6 edge+ for a monthly service fee of at least Php 2,299. The plan comes with unlimited calls and text to Globe/TM and a GoSURF 999 pack of 5GB mobile internet. Likewise, you'll also get free 1 month of Gadget Care, Navigation Bundle that allows access to apps such as Accuweather, Google Maps, MMDA App, Grab Taxi and Waze; and 1 GB of cloud storage through Globe Cloud. How about if I wanted to get the 64GB Globe Galaxy S6 edge+? If you wanted to have the beefier memory configuration, the 64GB Galaxy S6 edge+ is also available under the same plan with Php 1000 monthly cash-out for 24 months. It comes with the same bundle as the 32GB variant. Both plans also include a 3-month free access to either Spotify or HOOQ. Globe is now accepting registration for those who are interested to avail the Samsung Galaxy S6 edge+ and the Galaxy Note5. Both handsets will be available in Globe Stores nationwide on September 5.